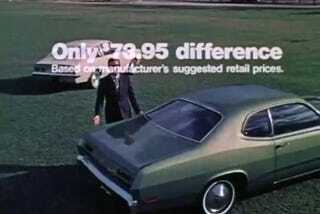 1972 Chevy Vega or Plymouth Duster? Get The Deluxe Wheel Covers and Whitewalls! If you're thinking economy car or any kind of car, remember: We'll take on anyone in our class and come through... for you! The Vega was a much more modern compact car than was the Duster, but the Duster came with the virtually unkillable Slant Six engine while the Vega's engine... well, let's not go there. Anyway, the Duster listed for a mere $73.95 more than the Vega (about $400 in 2010 bucks), so which would you have bought?